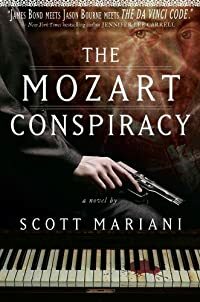 The Mozart Conspiracy by Scott Mariani, a Mysterious Review. Review: A popular series in the UK with six books written to date, The Mozart Conspiracy, the second thriller in the series to feature ex-SAS operative Ben Hope by Scott Mariani, is the first to be published in the US. Almost a year after his friend and former colleague Oliver Llewellyn drowns — an accident, according to the authorities — Ben is contacted by Leigh Llewellyn, an internationally renowned opera singer and Oliver's sister, who tells him she's been threatened and asks for his help. He meets up with her in London, where Leigh tells Ben that Oliver was working on a biography of Wolfgang Amadeus Mozart and was excited by the contents of a letter the composer had written to his brother just before his own death in 1791. After Oliver died, she had taken possession of all his research, which she had shipped to her country estate in Wales. Suspecting that something Oliver was working on may be the reason for the threats against Leigh, they travel to her Welsh home and find a video that Oliver made, filming the ritualistic execution of a man … but no letter in Mozart's hand. Now believing that Oliver was murdered for the recording, and that Leigh's life is also in danger, they travel to Italy on a quest to learn what may have been written in the Mozart letter that led ultimately led to Oliver's death. The pace of The Mozart Conspiracy is relentless, moving along so rapidly that readers may not realize that there is surprisingly little in the narrative that actually relates to Mozart. Indeed, it isn't until nearly the half-way point that one presumably learns why Ben and Leigh are being chased, and the justification for the trail of bodies they leave in their wake. Even so, it's all a bit sketchy — something about Freemason secrets being encoded into Mozart's final opera, The Magic Flute — and ultimately irrelevant, when it is revealed that the purpose for their pursuit is for a different, albeit related, reason altogether. A most exciting thriller, to be sure, and for the most part well executed, The Mozart Conspiracy, especially given its provocative if slightly disingenuous title, lacks a strong historical premise upon which to base its nonstop action. Acknowledgment: Simon & Schuster provided a copy of The Mozart Conspiracy for this review.